You are here: HomenextPlacesnextStreetsnextAnn StreetnextWhen was this photo taken? Do you remember these houses? If you can enlighten us on the date of this photo – please post a note below. Click on image to open a larger version in a new window. 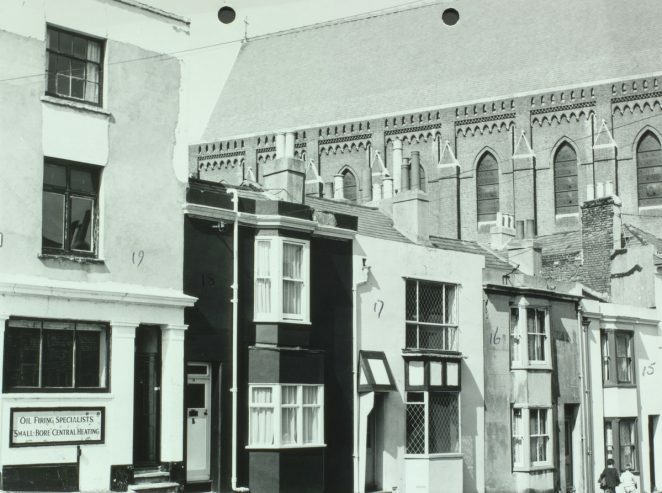 It’s St Bartholomew’s Church in the background, and from Google I would suggest that the houses seen were in Ann Street and demolished around 1975 to make way for the building of the new St Bartholomew’s School. I don’t know about WHEN this photo was taken, Jennifer, I’m having trouble in deciding WHERE it was taken! I’m thinking the east side of London Road, possibly Francis Street. I know the houses on the south side of Francis Street were demolished in the 60s. Of course, it could be the west side of London Road, but most of those streets behind St Bart’s were demolished years ago. Stumped, really. Anyone else? Hetex (Southern) Ltd was the heating company at 19 Ann Street (shown at left of picture) which went into liquidation in January 1969. We have no way of knowing whether this pre-dated or post-dated the picture. The flat above and surrounding buildings continued to be occupied until 1971-72 and the council acquired number 19 by no later than September 1970. I would therefore assume the picture was taken around 1971. No19, formerly the Mazeppa Inn.